In October 2014, the Centers for Medicare & Medicaid Services (CMS) announced that 90/10 enhanced federal funding would be permanently available for states making upgrades to their Medicaid eligibility and enrollment systems. This funding encourages states to retire defunct Medicaid systems, modify existing eligibility and enrollment (E&E) systems, and integrate Medicaid systems with other human services systems. On April 14, 2015, CMS issued a notice of proposed rulemaking (NPRM) to codify the 90/10 permanent extension and proposed changes to the Medicaid Management Information System (MMIS) standards and conditions, including a new modular certification process for MMIS. The agency is also soliciting feedback on how to encourage the sharing of Medicaid software and reduce duplicative costs. Public comments are due June 15, 2015. 1) CMS getting more involved in Medicaid procurement process - CMS is proposing a new contract review process and will help states develop acquisition roadmaps for future procurement. States will look for solutions that already comply with the Seven Standards and Conditions issued by CMS. 2) CMS proposing modular approach to certification - CMS recognizes that most monolithic contracts go over budget and over schedule when states get locked into one vendor, such as those in Maryland, Montana, Nebraska and North Carolina. The agency is offering to certify MMIS systems on a modular basis. We can see many states are already following this approach, such as Texas, Louisiana, Mississippi, and South Carolina. 3) Preference for shared software and COTS solutions - CMS is trying to encourage states to adopt commercial-off-the-shelf (COTS) solutions to save money and reduce duplicative implementation efforts. The NPRM proposes a 90 percent matching rate for COTS software, and vendors including HP, Molina, EngagePoint and Accenture are increasingly offering COTS solutions that are flexible and adaptable for states. While making 90/10 funding permanent, CMS is also using this opportunity to update certification procedures to keep pace with the MMIS modular procurement strategy most states are adopting. In 2015, Deltek is expecting MMIS rebids in Florida, Louisiana, Mississippi, Missouri, South Carolina, Texas and Virginia. Vendors will have a leg up on the competition if their solutions are in line with CMS standards for COTS products and align with the desire to use modular components and incremental delivery strategies. The benefits are greater with these approaches by reducing risks and lowering costs of complete replacements. Still, as strategy moves away from single fiscal agent contracts and big-bang implementations, states have challenges managing multi-procurements and relationships with several vendors. For more information on Medicaid procurements across the country, please see the GovWin MMIS Vertical Page. Medicaid eligibility and enrollment systems: Which states still need to modernize? Modernized and fully integrated Medicaid eligibility systems have proven to be a catalyst for successful enrollment in state and federally facilitated health insurance exchanges. Kentucky, New York, and Washington state have stood out for their top-performing exchanges and high enrollment numbers. All three states rely on integrated Medicaid eligibility systems that facilitate the consumer application process, eligibility determination, and enrollment in Medicaid/CHIP or private health insurance plans. On the other hand, states with outdated and isolated technologies struggled to enroll new customers, which led to significant Medicaid backlogs, most notably in California, New Jersey, and Tennessee. Now that the feds have finalized 90/10 funding and extended the OMB A-87 cost allocation exception, more states will invest in upgrading their Medicaid eligibility systems and building integrated eligibility systems that incorporate human services programs, including Supplemental Nutrition Assistance Programs (SNAP) and Temporary Assistance for Needy Families (TANF). This analyst perspective will help vendors identify which states have already completed upgrades, which states are currently modernizing, what contracts may be rebid, and where to find potential business opportunities. While states have been working to integrate and modernize eligibility systems for more than a decade now, the vast majority of states took steps in recent years to upgrade their Medicaid eligibility systems in preparation for ACA enrollment. In fact, 19 states have issued contracts for upgrades to Medicaid eligibility and enrollment systems since 2012. Some states combined contracts for health insurance exchanges with eligibility upgrades (HIX/IES), including Connecticut, Maryland, Oregon, Rhode Island and Washington, D.C. Other states are still in the early planning stages for eligibility system modernization efforts, and a few states have indicated their intent to release a solicitation in the coming year. Below is a preview of a few of these upcoming opportunities. Louisiana – The Louisiana Department of Health and Hospitals anticipates releasing a Medicaid Eligibility Determination System (MEDS) request for proposals (RFP) this month. The department is designing new enterprise architecture to modernize the state’s Medicaid technologies. The previous contract with Deloitte was worth approximately $29 million (Opportunity ID 99187). Massachusetts – The Massachusetts Executive Office of Health and Human Services plans to move forward with Phase II of the state health insurance exchange and integrated eligibility system (HIX/IES). The state expects to complete planning by the end of June 2015, and an RFP could be released sometime this fall, at the earliest. A $66 million contract with CGI was terminated in March 2014, and Optum and hCentive have worked to rebuild the system (Opportunity ID 89076). New York – The New York Office of General Services is seeking a systems integrator for its integrated eligibility system to replace the statewide welfare management system (WMS) – a legacy system first implemented in 1977. An RFP was issued in May 2014 for a business advisory services contractor that will work during the first phase of the IES project; the systems integrator will conduct phase two. Deltek anticipates this legacy system modernization could approach $100 million (Opportunity ID 49905). Tennessee – The Tennessee Department of Finance and Administration may have a requirement for the development and/or maintenance of the TennCare Eligibility Determination System (TEDS). The current contract with Northrop Grumman is behind schedule and the system remains unfinished, which has created months-long delays for Tennesseans who want to apply for Medicaid. Subsequently, three advocacy groups have filed a lawsuit against TennCare. The incumbent contract is valued at $35.7 million (Opportunity ID 117922). New Jersey – The $83.5 million contract with Hewlett-Packard for maintenance of the Consolidated Assistance Support System (CASS) has been terminated, and a spokeswoman for the New Jersey Department of Human Services said the state and the vendor are still in talks regarding the contract termination (Opportunity ID 105816). California – The 2014-2015 Governor's Budget Highlights for the Department of Health Care Services requested expenditure authority for a multi-year IT project to modernize the Medi-Cal Eligibility Data System (MEDS). In 2012, a contract was awarded to PCG for IT project planning consulting services, including a feasibility study and advanced planning document (APD) for the MEDS Modernization Project. An RFP for the Medi-Cal Program integrity data analytics is currently in development (Opportunity ID 69871). South Dakota – The state issued an invitation to discuss and demonstrate (IDD) to review and research existing Medical assistance eligibility systems that comply with the Affordable Care Act (ACA) and preferably have existing or planned capability to support other programs such as SNAP, TANF, Child Care, Low Income Energy Assistance (LIEAP), and Child Support. The Department of Social Services is now planning an RFP for an integrated eligibility system (Opportunity ID 83922). Washington – In 2013, the Washington State Legislature passed Senate Bill 5034, directing a study of the state’s medical and public assistance eligibility systems and infrastructure with the goal of simplifying procedures and reducing state expenditures. PCG was awarded the contract to conduct the Medical and Public Assistance Eligibility Study, which was published in September 2014. The state may continue to make efforts to modernize the medical and public assistance eligibility systems (Opp ID 104365). Now that 90/10 funding has been made permanent and the A-87 waiver is extended until December 2018, states will continue to make upgrades to eligibility systems, which could yield significant business opportunities for vendors. Deloitte is the dominant vendor in this space, currently holding contracts in more than 15 states. Other vendors holding contracts in multiple states include Accenture, IBM, Northrop Grumman, KPMG, HP, and Maximus. Contract values for eligibility modernization projects vary significantly based on the size of the state and scope of the project. Contracts for Medicaid eligibility modernization average between $20-50 million, while IES projects that include major system overhauls can exceed $100 million. Many states that have recently integrated health insurance program eligibility systems may now look to incorporate human services programs, starting the next wave of procurement activity. As Deltek continues to track upcoming eligibility projects, we encourage vendors to keep an eye on the above mentioned projects and expect to see more eligibility-related opportunities thanks to this funding extension. The U.S. Congress passed an omnibus funding bill for the remainder of fiscal year (FY) 2015 that includes $1.1 trillion in total in discretionary federal funds, roughly half of which goes to federal civilian departments and agencies. In part 2 we’ll look at HHS, DHS, Justice and State. Read our Civilian Highlights, Part 1. $2.7B in emergency funding to address the Ebola crisis. $3.6B for CMS management and operations, which is equal to the level put in place by sequestration and the same as the FY 2014 enacted levels. $6.9B for CDC for disease prevention and bio-defense research activities, $43M above FY 2014 program level. $30B for NIH, $150M above the FY 2014 level. $20M to combat prescription drug abuse around the country. The bill contains several provisions to protect life, continues all longstanding restrictions on abortion funding that have been included in appropriations legislation in prior years, and promotes abstinence education. $17.8B in discretionary resources for the Administration of Children and Families, which is a $108M increase. The bill provides no new funding for the Affordable Care Act. 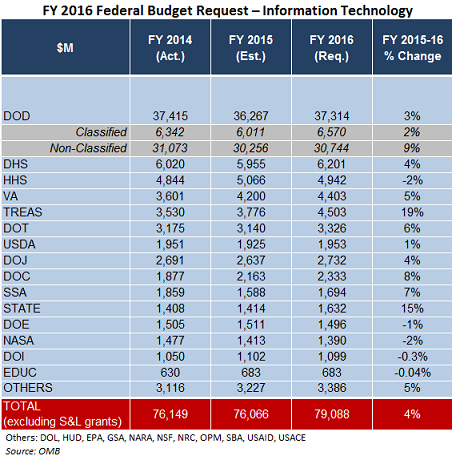 The Department of Homeland Security is the only department in the Omnibus that is not receiving funding through the remainder of FY 2015, i.e. September 30, 2015. The Omnibus funds DHS with a continuing resolution at the FY 2014 annual level of $39.3B through February 27, 2015 as media reports indicate that the Republican majority will seek to influence the implementation of the president’s recent immigration policy actions. Department of Justice funding of $26.7B marks a reduction of $600M below FY 2014 enacted levels. Federal Bureau of Investigation (FBI): $8.4B for the FBI increases resources by $93M over FY 2014 levels to support activities around counter-terrorism, cybersecurity, and human trafficking. Drug Enforcement Administration (DEA): $2.4B marks an increase of $21M over the 2014 enacted level. Bureau of Alcohol, Tobacco, Firearms and Explosives (ATF): An increase of $22M above 2014 enacted levels brings ATF funds to $1.2B for 2015. National Instant Criminal Background Check System (NICS) Initiative grants: $73.0M in grants are provided to improve NICS records. These grants are expected to assist states in identifying and executing approaches to add more records to the system, particularly mental health records. Prescription Drug Monitoring Programs (PDMPs): New state laws promoting the increase of PDMP best practices around prescribing controlled substances maintain support for technical assistance for PDMPs, PDMP data users, and other key stakeholders. Additionally, DOJ is expected to identify and report on specific metrics related to cybercrime and cybersecurity efforts that may be measured. The Department of State and USAID appropriation of $49B includes $15.7B in base and contingency funding for operational costs of the State Department and related agencies, of which $5.4B is targeted for embassy security. 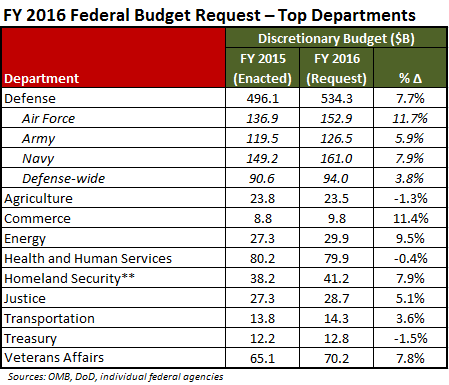 Go to Part 3 of Civilian Highlights, or check out our Defense Highlights of the FY 2015 Omnibus here.